Greetings! I need some help finishing a Joke. 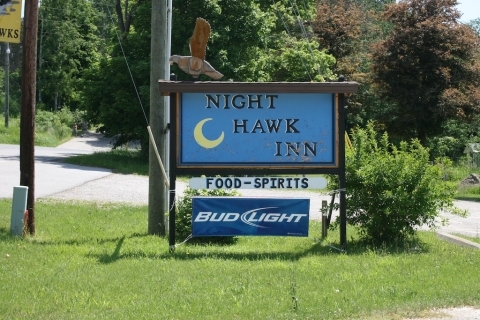 This picture is from the little town of ‘Hawks’ in Presque Ilse County, Michigan where the local watering hole is called “The Night Hawk Inn” They host Euchre tournaments, darts and softball games too. They welcome fishermen, hunters, and sportsmen of all kinds. I always wondered what would the bartender say if a Falconer walked into this bar with a Hawk in his fist. If can think of a better punchline, post it here!